I’ve been way too busy lately with work to do fun things on the weekend, so I was happy to enjoy two entire days doing things I love. Create cocktails, write, read a book, sit outside. It was kind of amazing. It was certainly what I needed to recharge after a busy January. I spent some of this time trying to find a new way to make an old favorite. Sangria! There are so many varieties of sangria, and I find that the basic ones are best. I shared a few sangria recipes last year for Cinco de Mayo, but I wanted to tweak the Champagne recipe a bit. For Valentine’s Day I wanted something fruity with lots of RED! Strawberries are currently in season here in Florida, so I knew I had to top my beverage off with these fresh fruit. I usually mix Sprite, Triple Sec, and sugar into whatever sangria I create. However, Target had a variety of fizzy juice beverages that I had never seen before! I bought two kinds: Peach Mango and Strawberry Raspberry. I thought the peach fizz would be a great addition to champagne and fruit, and thus, the Strawberry Peach Champagne Sangria drink was born. A sweet way to enjoy sangria! 2-3 cans of Simply Balanced Sparkling Peach Mango (I used two cans at first, but added more as I stirred and got the balance perfect). Combine ingredients and let chill for at least two hours. Be creative and add your favorite fruits! I think pineapple would go nicely with this mix as well. While one of my friends said it looks like Mountain Dew, I assure you it’s just the coloring of the glass! 🙂 Saturdays are meant for blue mason jars and paper straws! Can never have enough fruit! What’s your favorite type of sangria? Krystal’s Kitsch is a blog that shows a slice of my Florida life. I strive to share simple ways to host parties, decorate your home, and serve healthy and delicious cocktails and food recipes. This blog has been around since 2008, and it has become a place to document my life in graduate school, my wedding planning, and my first time becoming a mom. As a born and bred Florida girl, I also post travel and life articles about the Sunshine State. Subscribe and stay awhile, OK? Serve up this bubbly brew at your next event! 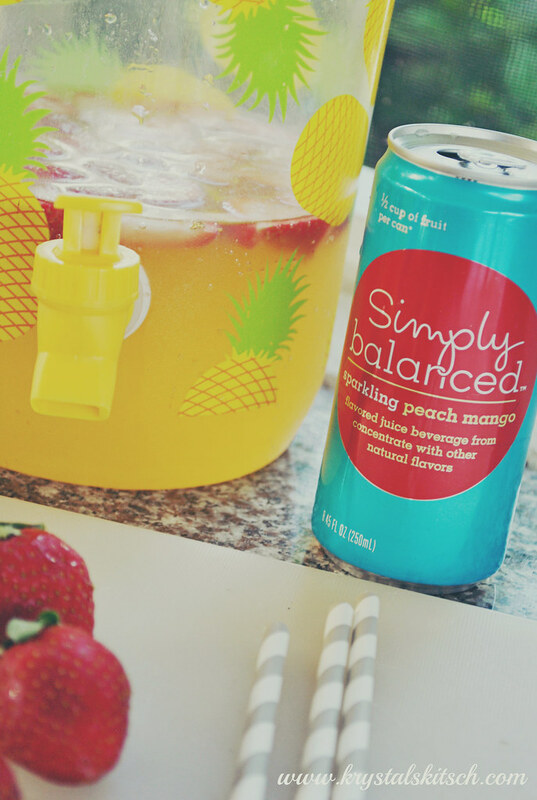 This easy strawberry peach champagne sangria has the perfect fruit flavor. Don't forget fresh strawberries! 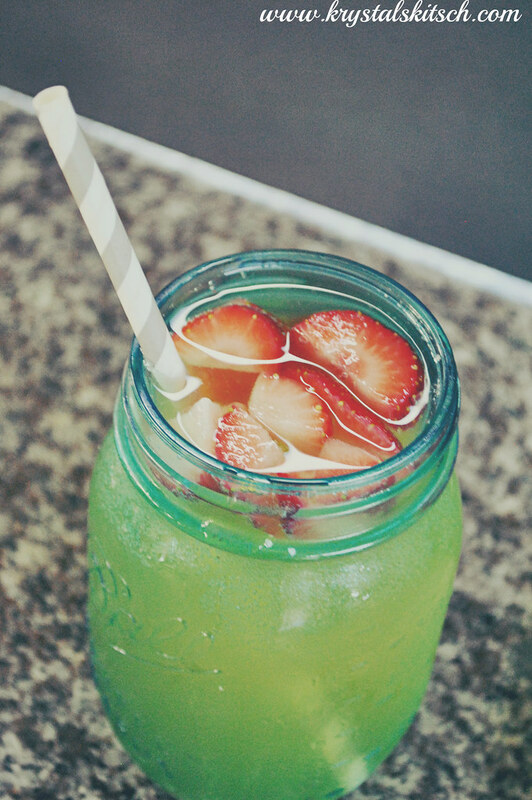 looks so refreshing and easy to make. i loved those fun projects link. I love your drink idea. It looks really tasty. Ah! This sounds so refreshing. I definitely want to make up a batch for a girls night in I’m planning. That looks really good with the fruit inside. Sounds refreshing even without the alcohol! Ooo – definitely repinning this for later. The combination of fruity flavors is right up my alley! Oh, that sounds so delicious! And the pic looks so refreshing! I wish I had some now, it’s so hot and humid that I really need one. Oh yeah…this is right up my alley: strawberry + peach. I Pinned this earlier and seven people have already repinned this recipe, so I can see this as a popular drink for the summertime! This looks great! Unfortunately, I can’t really drink champagne, but it looks so refreshing! Pinned! I can not wait to try to make myself! You definitely had me at champagne! I would love to try the Peach Mango drink. Yum! 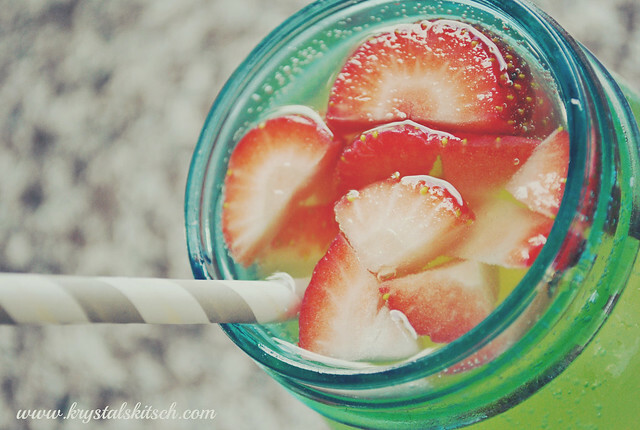 Cannot wait to make this for those lazy weekends sitting by the pool.. it will be so refreshing! I love your friends comment on the mountain dew, I actually didn’t think that. LOL. Looks yummy! I would like to do this without the alcohol. The combination of fruits sound so yummy! I have visitors coming over tomorrow. I think this would be great for that!